Rachel Hobson is a writer, editor and social media enthusiast with a background in the DIY/Maker and science/geek communities. She's also a life-long space geek, and enjoys living five minutes from Houston's Johnson Space Center where she can get her fill of rockets any time she pleases. Her hobbies include hand embroidery, modern quilting and all things Lego. Yesterday saw the final space walk of the shuttle program, and one of the top tasks on the agenda was installing the Robotic Refueling Mission. 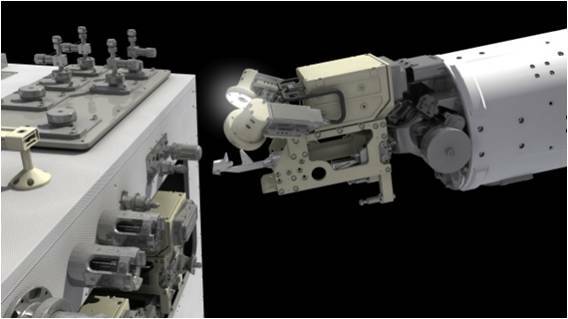 Robotic Refueling Mission (RRM) demonstrates and tests the tools, technologies and techniques needed to robotically refuel satellites in space, even satellites not designed to be serviced. I was at Kennedy Space Center last week for the launch of STS-135, and had the opportunity to talk with former astronaut John Grunsfeld about the RRM. It turns out that Grunsfeld is a big fan of MAKE, and he described the RRM as being a very “MAKE” project. He gave me a tour of a full-sized mockup of the RRM in the KSC newsroom and showed how it will be used to test how a remote-controlled robot can access and service satellites in space. The RRM is about the size of a small office copy machine and will work in conjunction with Dextre, “the two-armed robot developed by the Canadian Space Agency to perform delicate assembly and maintenance tasks on the station’s exterior.” Remote-controlled by humans on earth, Dextre will use a handful of robotic tools to perform tasks that would be used in a servicing and refueling mission on a satellite. 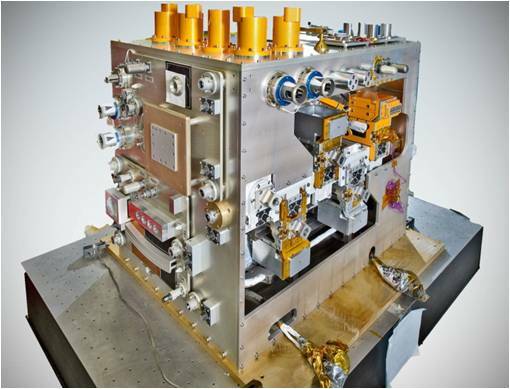 The cool thing about all this (as if robots in space weren’t enough) is that the RRM was designed to show how it can be used to service satellites that were never intended or expected to be touched again once they were set in orbit. This opens up new possibilities for extending the life of satellites by accessing them remotely from earth using robotics. Because the satellites were never expected to be serviced, though, there is a good deal of “play” and experimentation that has been done to come up with ways to access the satellites and work on them. Grunsfeld likened it to makers tinkering at their workbenches. There’s even a “busy board” component to the RRM that will allow experimentation to show how robotics can be used to handle a variety of tasks that could be needed in satellite servicing. All of these operations will be remote-controlled by humans on earth. You can read more about the RRM on NASA’s web site.